A Lamy fountain pen says something about your personality. They are symbols of formality especially favoured by businesspeople. In 1930 the Heidelberg family founded LAMY and marketed it as an independent family ran business. The first success story for LAMY came in 1966 with the Lamy 2000. It was so successful that the unmistakable design of the pen (AKA the Lamy Design) is still defining the pens produced by LAMY today. Today, the company produce over 8 million writing instruments annually with a turnover of more than 110 million Euros (2016). This has caused LAMY to not only be the market leader in Germany but an internationally popular brand. Fountain pens allow the user to show off their personality. LAMY do this perfectly, not only allowing you to establish your character the pens can help make your writing unique. This is thanks to the wide range of nibs that make the pens easily adaptable to everyone and anyone. Not only are LAMY pens excellent writing tools, they look stylish too. What colour inks do LAMY offer? The LAMY T10 ink cartridge is compatible with the fountain pen range. There are eight main colours Lamy offer as well as a number of limited editions still available on the market today. The T10 cartridges come in a pack of 5 ink cartridges. Ink Cartridge or Ink converter? There are two different ways you can get the ink to use in your fountain pen. These are Ink cartridges and ink converters. But what’s the difference? Ink Cartridges are small disposable capsules containing the fountain pen ink. They attach to the back of the fountain pen which causes the cartridge to supply the pen with the ink. Once the ink cartridge runs out you can simply detach the empty cartridge, throw it away and replace it with a new one. Ink cartridges are likely to hold less ink compared to converters and although mess free to some degree as you are not having to physically deal with the ink yourself if the cartridge bursts this can be a problem. Whereas Ink Converters connect with the fountain pen in the same manners as ink cartridges, however, a small plunger runs inside the converter to draw the ink into the fountain pen. Unlike ink cartridges, converters are reusable as when out of ink, you can simply dip the nib into a fountain pen ink bottle and draw the ink up into the pen via the nib. However, this can get messy as if you are not careful the ink could spill. Also, even though reusable, converters are not as easy to transport as you will be required to take the actual ink bottle with you. How should I look after my fountain pen? How you should look after your LAMY fountain pen depends on the pen you buy. 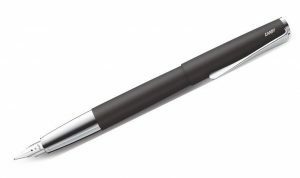 For example, the LAMY Safari fountain pen is a highly durable pen. It can survive getting thrown around in your bag and will only require a bit of TLC every now and then to prevent the feed and nib from clogging up. This can be done by flushing the pen and cleaning the nib. However, it would be best to store the more expensive pens in a case when being carried around in your bag or pocket. This can prevent the nibs from accidentally snapping. Which nib do I need? 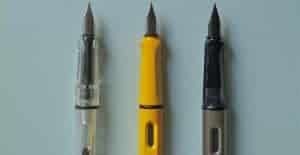 As with most pen companies, LAMY offers various types of nibs to go with their fountain pens. But what kind of nib do you need? Nibs come in three basic shapes. These are round, stub and italic. The most popular nib shape is round as it can provide a fairly straight line on paper. For those looking to get into calligraphy stub and italic are the more appropriate options. Which is the best LAMY fountain pen 2018? 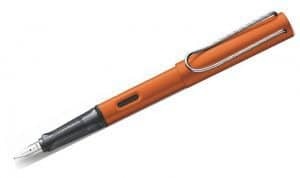 The Lamy Safari Fountain pen is one of the most popular fountain pens offered by Lamy. This is no surprise as the choice of eight different colours ranging from black to pink (more than any other Lamy fountain pen) means this pen can be suited to pretty much anyone. The pen is made from sturdy ABS*(Acrylonitrile Butadiene Styrene) plastic, includes a flexible clip to ensure the pen doesn’t get lost and makes use of a recessed grip to guarantee writing comfort. The Safari pen can work with either the Lamy T10 cartridges or the Z28 Converter. If you’re looking to make writing easier the Lamy Al Star could be a good option for you. 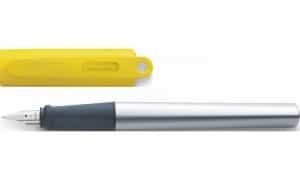 The pen is lightweight and durable and is characterised by the light yet robust full metal aluminium housing. The advantage of aluminium housing is that the material is resistant to impacts and scratches. Located on the pen itself are the striking ergonomic grip moulds, an ink view window and a metal clip. Available in 6 different colours, the colour of the pen is not the only eye-catching feature, the transparent plastic grip makes a pleasing contrast to the rest of the pen. Not only a high-quality pen, the Lamy Logo has a stainless steel finish. The pen is extremely slim with a spring-loaded strip-steel clip making it an elegant pen to write with. The pen can either have a steel or polished nib and it uses Lamy T10 ink cartridges but can also be used with a Z27 converter. The logo is only available in matt steel so if a pen that is bright in colour is what you’re after maybe avoid this one. The Lamy Nexx allows for extended fatigue-free writing thanks to the soft non-slip grip. The pen is also light and utilises an exceptionally sturdy aluminium body whilst the cap to the pen is plastic. The metal clip allows the pen to easily attach to your work or a notebook. The pen uses the Lamy T10 ink cartridge but can also be used with the Lamy Z28 converter. Offering excellent flow and smooth writing the Lamy Studio makes for an attractive looking pen. The cartridge filler system with ink cartridge is the Lamy T10 however it can be modified to fit the Z27 converter if you prefer. The nib can be either a steel nib or polished depending on your preference. When looking at Lamy fountain pens, the pens massively vary in price which can leave you confused as to which is best for you. However, we believe the Lamy Safari fountain pen is the best option when you are wanting a new fountain pen. Not only are they lower in price when compared to other pens they offer the most colour options. Available in a range of nib sizes the perfectly designed ergonomic pen can suit just about everyone. It is no surprise that when looking at these features the Lamy Safari fountain pen is a best-seller, especially amongst younger writers and beginners. The innovative design has ensured that this pen has been popular since the market launch in the 1990’s.